Recently, Rainier Valley Corps’ Fellows completed a training on storytelling and nonprofit communication. The training was led by Nikkita Oliver, organizer, educator, lawyer, and poet. I was particularly interested in attending this training myself because of the challenges I face in attempting to share and communicate highlights and lessons learned from the Fellowship Program. Even now, as the second cohort of fellows are halfway into their first year, I am cautious of how we share the stories and complexities of each individual fellow as well as the cohort as a whole. How do we acknowledge our multiple identities, both the ones we claim and the ones that have been put onto us? It was a powerful way to consider the identities we embrace and ones forced on us or the ways others see us impact our identities. The point of this activity was to understand how our identities intersect in relation to others and the world. For example, I am the daughter of middle-class Ethiopian immigrants who moved to the United States and whose parents were regulated to working-class status. The experiences of my parents have deeply impacted my experience as a first generation person in the US. I don’t have first-hand experience of leaving behind everything I knew and moving to a new, unfamiliar land with hope and enough resilience to overcome the disdain they surely faced as Black immigrants. But I understand and have been impacted by those experiences. It’s one of the profound sources that dictates many of the choices I make, the paths I take, and what led me to commit my time, skills, and passions towards this work. 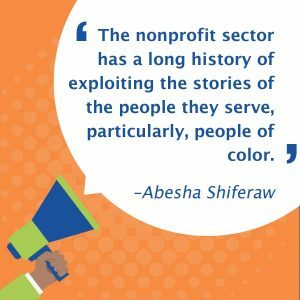 The nonprofit sector has a long history of exploiting the stories of the people they serve, particularly, people of color. This perpetuates racism and oppression, etc. Known examples are the stories and images you see on TV of “the starving and dying and warring” children and peoples, particularly in Africa. 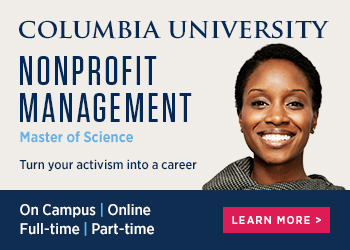 The nonprofit sector continues to struggle with diversity among staff, which contributes to non-people of color telling the stories of people of color. With that said, until there is a radical shift in social, political, and economic power locally and globally, we must be cautious and tell stories that empower people and highlight the strengths, liberation, and self-determination of our communities. Here are some guidelines and things to consider when writing or sharing the stories of the people we serve. Is this the story that you, as the facilitator of the story, should be telling or can someone else? Are you connected to, part of, or a member of this individual’s community? This, especially, is a critical question for white folks telling stories of people and communities of color, able-bodied people telling the stories of people with disabilities, cisgender people speaking for and telling stories about trans folks, etc. Is their consent informed? Do they know how and where the story will be used? What content it includes? 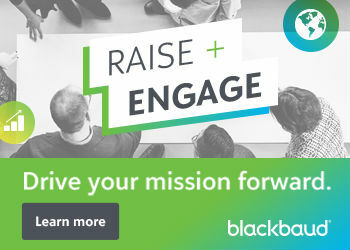 Do they agree with the way you’re sharing how your services have impacted them? Are they able to approve changes and edits? If necessary, do you have written informed consent? By telling this story, are you showing your organization as a savior? Do you have a process for those who have told their story to have the agency to retract consent/permission? This means if you’ve used their story, they can take back their permission and consent to no longer share or highlight their story. I encourage you to create your own guidelines that align with the mission and values of your organization and your personal identities. This article was originally published on Rainier Valley Corps’ Change-Makers blog and is reprinted here with permission. Abesha is Rainier Valley Corps' Program Director. She is passionate about building community and empowering communities of color, in all their forms, to speak for themselves, to be at the decision-making tables, and to be the force of change for the issues and challenges that are the result of institutional and systemic failures. 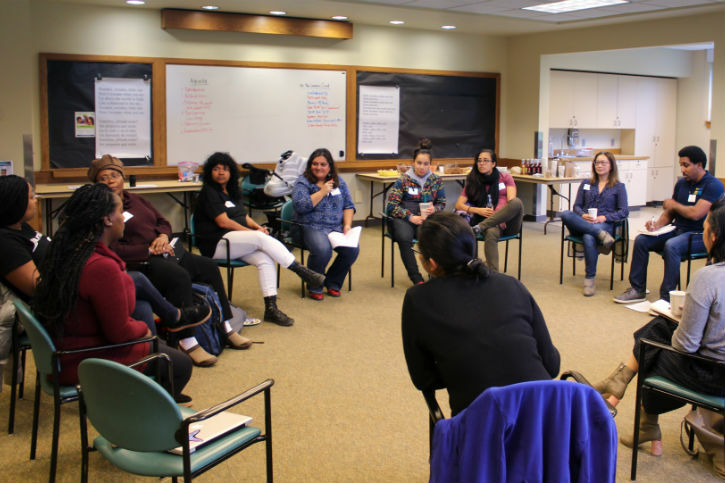 Rainier Valley Corps is a Seattle-based nonprofit that empowers and builds capacity within communities of color through a cohort of emerging leaders of color as well as through its operations support program.